snacks for 100 calories or less. 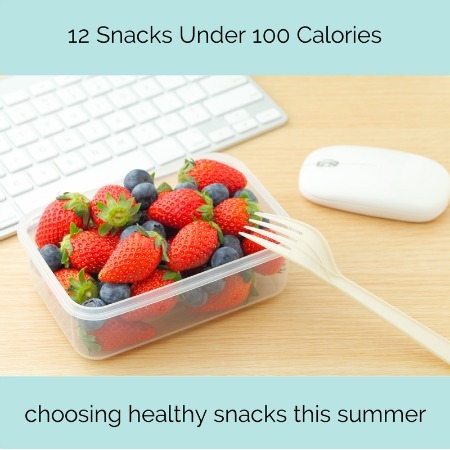 I don’t know about you but in the summertime we are snacking a lot! We snack at the pool, at the park, in the car, and even at home. It seems too hot to spend a lot of time in the kitchen cooking, so we do a lot of snacking throughout the day. Sometimes we even have larger snacks for meals. I don’t want to be absent-minded about the snacks we are eating. I want to feed my son, my husband, and myself wholesome food — even in the lazy days of summer. I compiled a list of 12 snacks under 100 calories. Today I’m sharing it over on the Knoxville Moms Blog. I hope you will head over there and read it! Let me know what your favorite snacks are. We aren’t the only snacking family are we?? You can find my post with healthy snack options over here.